January 11, 2017 By Aileen Leave a Comment This post contains affiliate links. As an Amazon Associate and member of other affiliate programs, I earn from qualifying purchases. 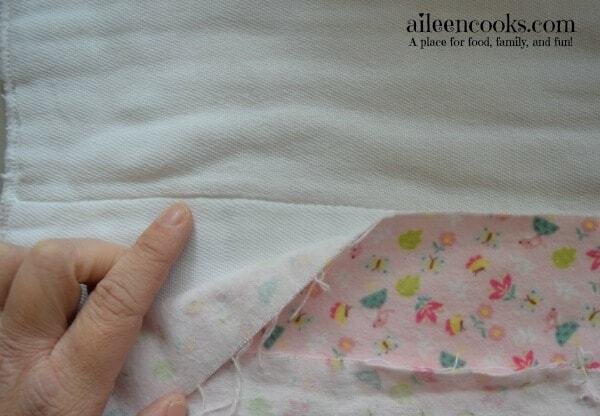 I have used this burp cloth pattern many times over the years. It is my go-to handmade baby shower gift and I have also made them for my own children. 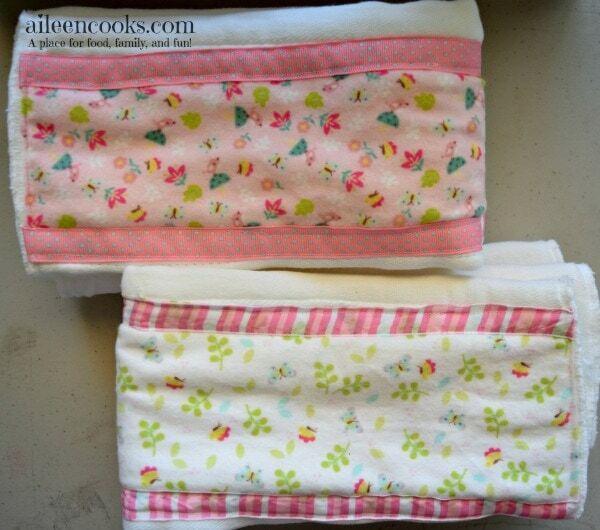 When I received an invite to my cousin’s baby shower, I immediately new I wanted to make her these burp rags. 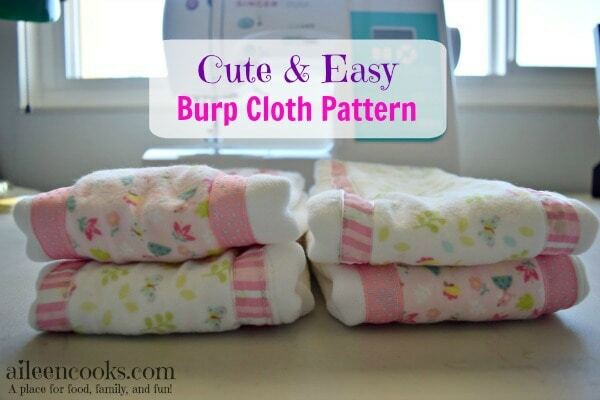 These DIY burp cloths are cute and practical. I like practical. I also love the teeny tiny dresses and shoes, but I have found (after having two little girls of my own) that those items don’t get a lot of use. I spent more time ironing each and every 3 month dress for Katie than she actually spent wearing them. So I decided against the baby outfit shopping and went the handmade route. 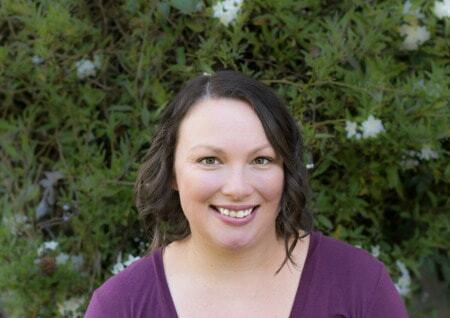 I knew this was the perfect opportunity to share the pattern with my lovely readers. This pattern is a great beginner pattern. 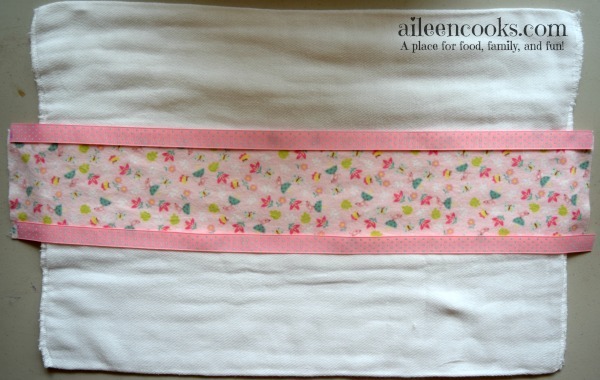 These cloth diaper burp cloths are one of the first things I made with my sewing machine and I am including a step-by-step tutorial for the beginning sewers out there. Start by prewashing and ironing the cloth diapers, fabric, and ribbon. Line the long side of one of the fat quarters of fabric to one of the center lines of the cloth diaper (pictured below). 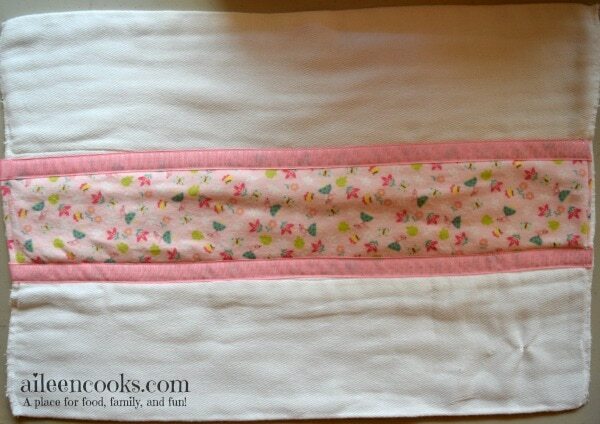 Fold the fabric over on the other center prefold line of the cloth diaper. 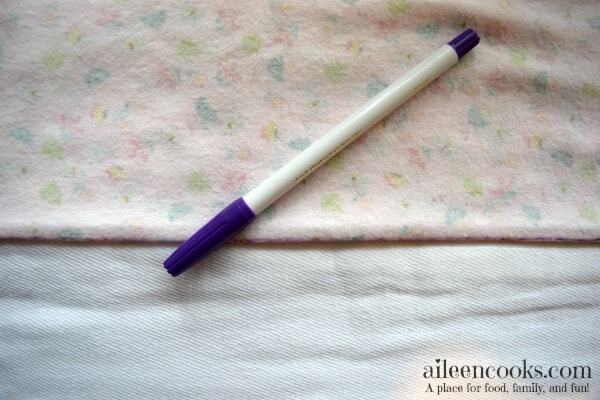 Using a disappearing ink pen, make a line on the crease. 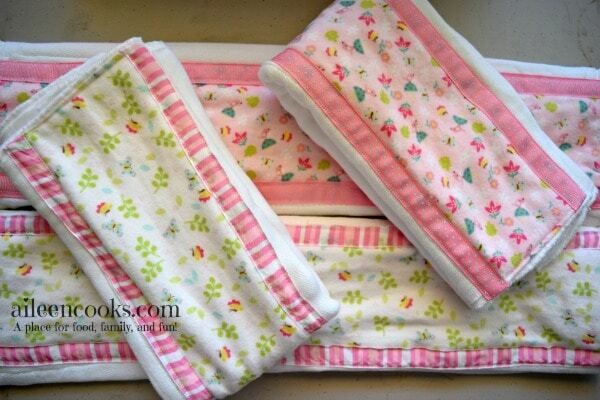 Repeat 3 times, so you have 4 strips of fabric that fit in the center fold of the cloth diapers. 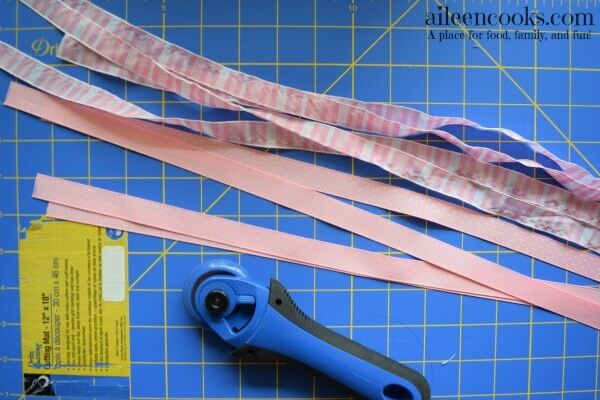 Using the fabric strips as a guideline (not the diapers), measure out the ribbon so it’s the same length as the long side of the fabric strips. Cut 8 pieces of ribbon (one for each long side of fabric). 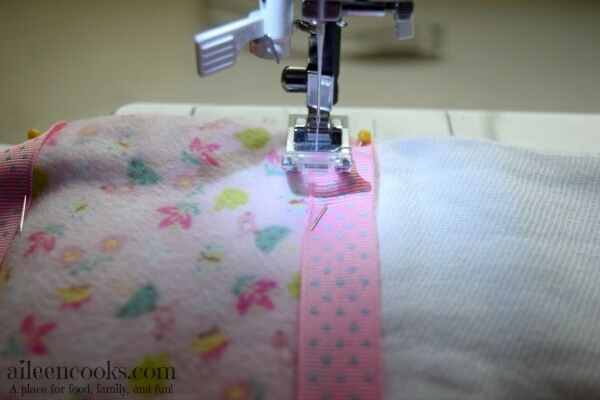 Arrange the fabric and ribbon on the center of the cloth diaper and pin. 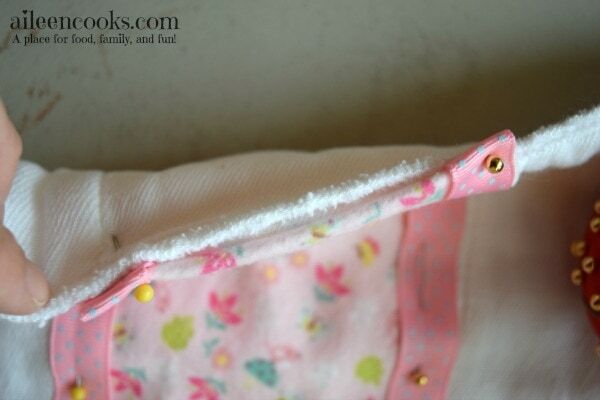 Fold the fabric and ribbon underneath on the ends of each cloth diaper and pin. 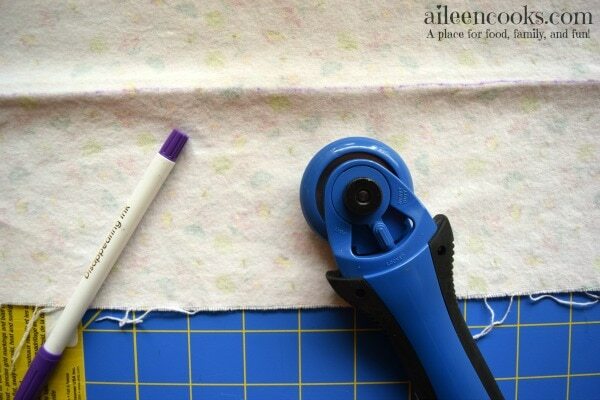 Starting on the inner edge of ribbon, sew the length of the cloth diaper, attaching the ribbon, fabric, and diaper together. 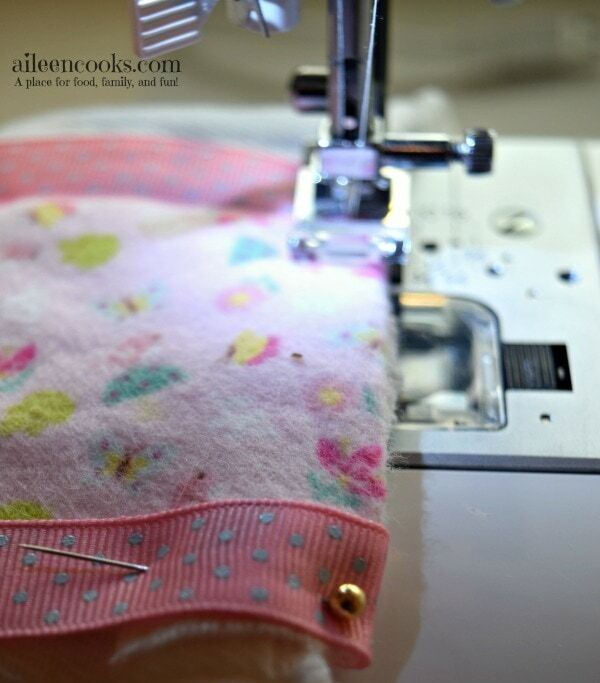 Turn the fabric, sewing along the short edge. Turn again and continue to sew on the inner edge of the other peice of ribbon. 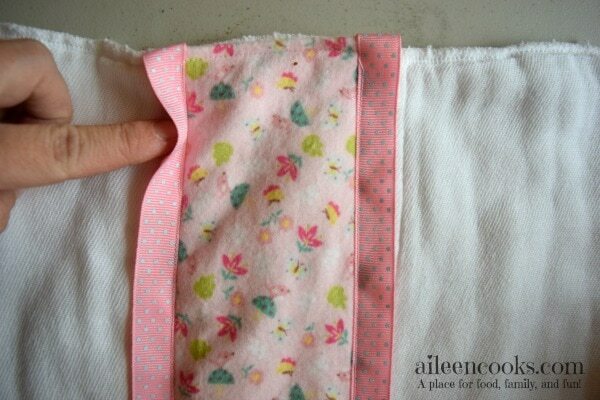 Continue sewing until you have made a rectangle around the inner edges of the ribbon. 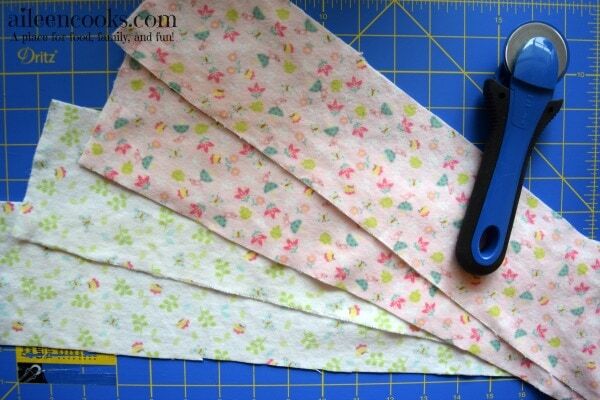 Sew along the outer edge of each piece of ribbon. Now your burp cloth is complete. Repeat with the remaining three cloth diapers. Sit back and enjoy your hard work. You just made something beautiful and practical. Do you like to make handmade gifts? Let me know what you make in the comments!